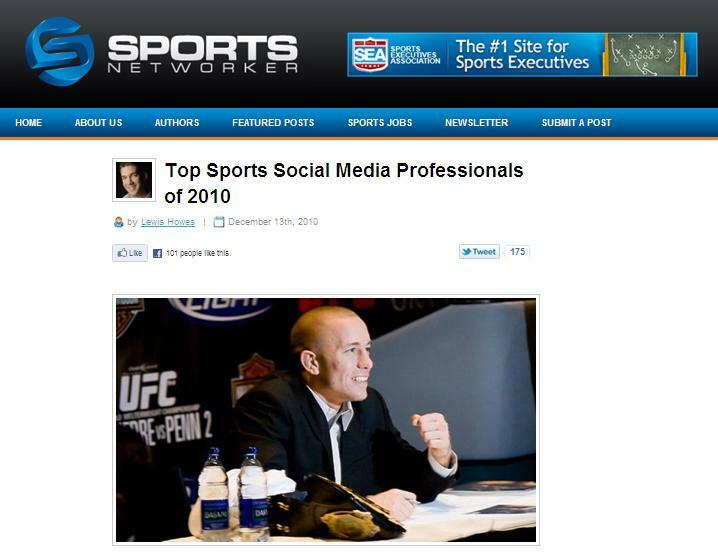 In mid-December, Lewis Howes and the SportsNetworker.com held a poll to gauge who was the Top Sports Social Media Professional of 2010. I was honored to be included among a number of noteworthy nominees (see below) and just wanted to say a quick thank you to all those of you who voted for me and have helped spread the word about the site. The final results were announced late last week and CNBC's Darren Rovell was named the winner but I am honored to say that I finished as the runner-up with 370+ votes. There are so many terrific individuals doing amazing things in the sports social media/sports business space and I really do appreciate everyone's continued support for Partnership Activation. I had the honor of guest blogging for Darren Rovell on CNBC.com in 2008 and really consider it a privilege to be considered in the same class as him. I wanted to send a quick note of congratulations to all of the other nominees that were considered for Top Sports Social Media Professional of 2010, including: Jim Bankoff (SB Nation), Matthew Higgins (NY Jets), Amy Martin (Digital Royalty), Darren Heitner (Sports Agent Blog/Dynasty), Russell Scibetti (The Business of Sports), Ben Sturner (Leverage Agency), Daniel McLaren (UK Sports Network), Jason Peck (JasonFPeck.com), Scott Phelps (Pittsburgh Steelers), Ash Read (FundSport.com), Sam Taggart (Vaynermedia), and Stephanie Bagley (Vaynermedia).